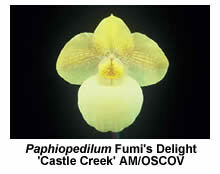 Paphiopedilums, commonly known as slipper orchids, are among our most popular orchids. 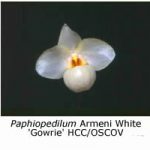 In nature they are found in many of the countries immediately north of Australia, the highest concentrations being located in Indonesia, Malaysia and Thailand, as well as in southern China and northern India. While we tend to think of these regions as being tropical and therefore hot year round, the majority of paphiopedilums grow in mountainous regions where the high elevation, constant air movement and shading by trees reduce temperatures to much more temperate levels. 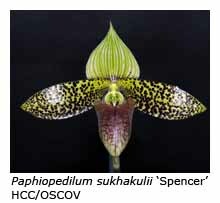 Accordingly, many of the species paphiopedilums can be grown satisfactorily in cool to warm protected conditions, while those hybrids with cool-growing species in their parentage will tolerate cooler conditions. HOUSING. 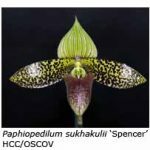 Given Melbourne’s climate of hot, dry summers and cool, wet winters, paphiopedilums require some protection throughout the year. In summer the plants need to be shaded to avoid sunburn and excessive heat, while in winter protection is required from rain, hail, frosts and low temperatures. A heated glasshouse is best for those with a large collection of paphiopedilums, while small collections can be grown perfectly well indoors on a shaded windowsill or bench. If desired, the plants may be moved outdoors in summer to a well-shaded position, and placed above ground level to ensure good air movement. 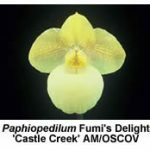 Paphiopedilums appreciate good air movement. In a glasshouse this can be provided by means of an electric fan; indoors the plants should be placed in an airy position but not in a draught. Good light is also important but avoid placing the plants in direct sunlight shining through the window, as this can burn the leaves and stunt growth. Paphiopedilums prefer a damp (but not soggy) mix, and their pots should never be allowed to dry out completely. Watering is required throughout the year, usually once a week in winter and two or three times a week in summer, depending upon the weather. After watering, use paper towelling to soak up any water that has collected in the centre of the growths. 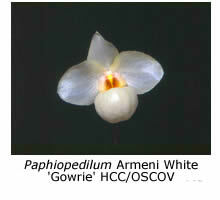 Paphiopedilums grow well in small pots and should never be over-potted. While large plants can be left in the same mix for up to two years, smaller plants respond well to annual re-potting, preferably in spring. A bark-based mix (particle size, 5-10 mm) provides quick drainage. Fortnightly applications of liquid fertiliser at half the manufacturer’s recommendation will ensure good.